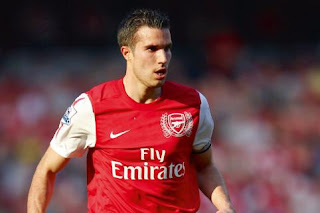 Finally Alex Ferguson has been able to secure Arsenal's prized Dutch Robin Van Persie (RVP) in the kitty of Manchester United. Arsenal Football Club has also confirmed they have agreed with the transfer to Manchester United. The tranasfer fee has been totalled to be around £24,000,000. Manchester United are yet to agree personal terms with the Arsenal Centre Forward, however it's reported that he will be making the journey up to Manchester on Thursday to hold talks with Sir Alex Ferguson and the Manchester United board. "Arsenal Football Club can confirm that terms have been agreed for the transfer of Robin van Persie to Manchester United." RVP has been with Arsenal since 2004 with 194 appearances and staggering 96 goals for the Gunners. With Persie's move to United, will boost Ferguson's team, with recent move of Ji Sung Park have been able to able an able contender to replace him.